No matter what time of day or night, a steaming bowl of pho noodle soup is never hard to find in Vietnam. Just like pad thai in Thailand, pho is Vietnam's unofficial national dish, exported with pride all over the world. What Goes into Your Favorite Pho Dish? Traditionally, pho noodle soup was eaten by Vietnamese people for breakfast and sometimes lunch. Today, both locals and foreigners alike can be found hunched over steaming bowls of pho at street carts throughout the night. Despite its outward simplicity, pho is underpinned with a complex arrangement of flavors and textures. The best pho outfits focus on creating a clear but flavorful broth. It's harder than it looks: pho cooks rely on a well-made soup stock and a cleverly formulated spice mix that primarily uses anise and cinnamon, with touches of cardamom, fennel, and cloves. Roasted onions and sliced ginger add a final, herbal topnote to the soup. Next come the noodles: freshly-made flat rice-flour strands that constitute the real bulk of the dish. The noodles play off the small amounts of meat – thin slices of beef, or springy meatballs – which are cooked separately from the broth and included at the last minute. You'll find condiments served alongside your pho, but these should be strictly optional – and for really well-made pho, completely unnecessary. You may be tempted to season your pho to taste before eating, but real pho enthusiasts savor the broth before uncorking the fish sauce or squeezing that lime. For all this, pho is cheaply available everywhere in Vietnam; one large bowl costs only about VND 20,000-40,000 (about 90 cents to $1.80; read about money in Vietnam). Pronounced something like "fuuuh" with a drawn-out vowel, pho is difficult for Westerners to say correctly because of the tone. Luckily, pho is easier to eat than to pronounce. When the pho arrives, take your chopsticks in your dominant hand and the soup spoon in the other. Start with the broth: sip it and take in the deep, rich flavors of the meat that's been boiled into every drop of the stuff. The aromatics come next: the star anise, ginger, and cinnamon should saturate your nostrils as you sip the hot liquid. Slurping is completely acceptable, even encouraged: it shows you're enjoying your meal and is a high compliment to the cooks! Read about etiquette in Vietnam. After you taste the broth, season to taste. Squeeze lime, or trickle a little fish sauce, or put in a pinch of black pepper. If the broth is already good, skip this step. Add the vegetable garnishes with your chopsticks, and push the greens to the bottom of the bowl to cook them slightly in the heat. Don't put the leaves in whole: tear into pieces before adding them in. Where did Pho Really Come From? 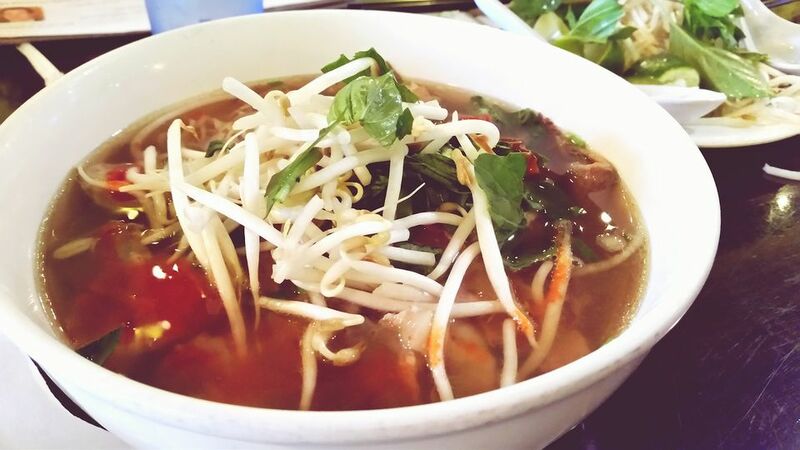 Despite its popularity, opinions differ about the origins of pho soup. Culinary experts generally agreed that the rice noodles were brought by Cantonese immigrants from Guandong province in Southern China. Some say the soup itself was influenced by the French during their colonization of Vietnam, however, locals dispute this theory. The Vietnamese claim that pho originated in the Nam Dinh province just southwest of Hanoi and then spread to other parts of the country. To this day, Hanoi residents revel in the North's claim to having invented pho. Northerners serve their pho with the vegetables already incorporated in the bowl of the soup and noodles; only those barbarians in the south serve the vegetable garnishes separately! Northern pho answers to the name pho bac: the stock is unsweetened, using a different spice mix scented primarily with star anise. Read about Hanoi's unique take on Vietnamese food. Ingredients and styles of pho noodle soup vary by region throughout Vietnam. Pho ga typically means that the dish contains chicken; pho bo means the dish is prepared with beef. The former uses whole chickens boiled in the stock pot; the latter uses oxtail, flank and beef bones. The ultimate pho dish - not for the faint of heart - is known as "specialty pho" (pho dac biet) and contains every type of meat available in the restaurant including chicken hearts, liver, beef tripe, and tendons.